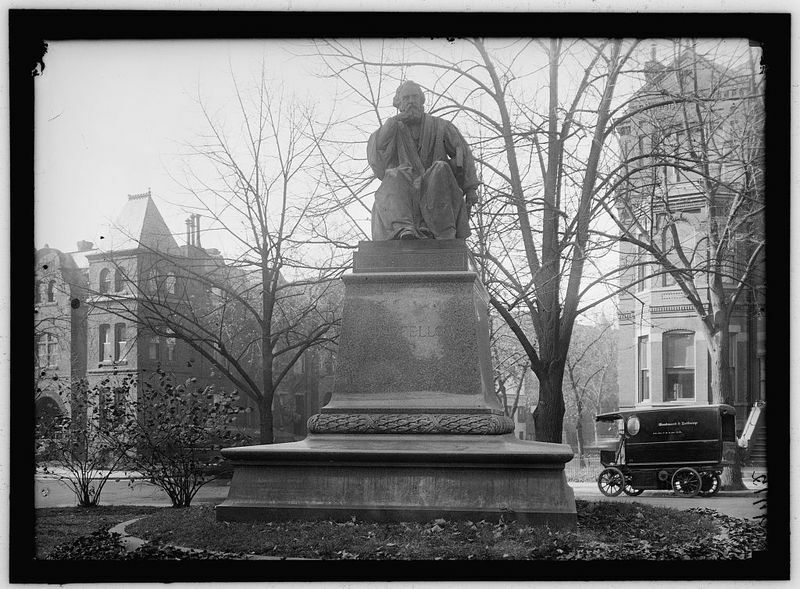 The monument to Henry Wadsworth Longfellow (1807-1882) was erected in 1909. This bronze portrait statue, begun by sculptor Thomas Ball and completed by William Couper, rests on a granite pedestal and faces east. The sculpture reflects the tenets of naturalism. Wearing a scholar's robe, the poet sits in an Empire-style chair. His right hand supports a bearded chin while his eyes stare ahead lost in thought. His left arm has dropped downward, below the seat of the chair, while the hand holds a partially closed book with its index finger remaining between the pages. The portrait sculpture sits on a reddish-pink, polished granite pedestal. Its base incorporates a broad rectilinear platform that supports a more narrow volume with tapering sides. The transition between the two masses is delineated by a robust, unpolished molding comprised of rows of laurel leaves, with a berry between each leaf, marked by crossed bindings; as a whole, its form implies a wreath. 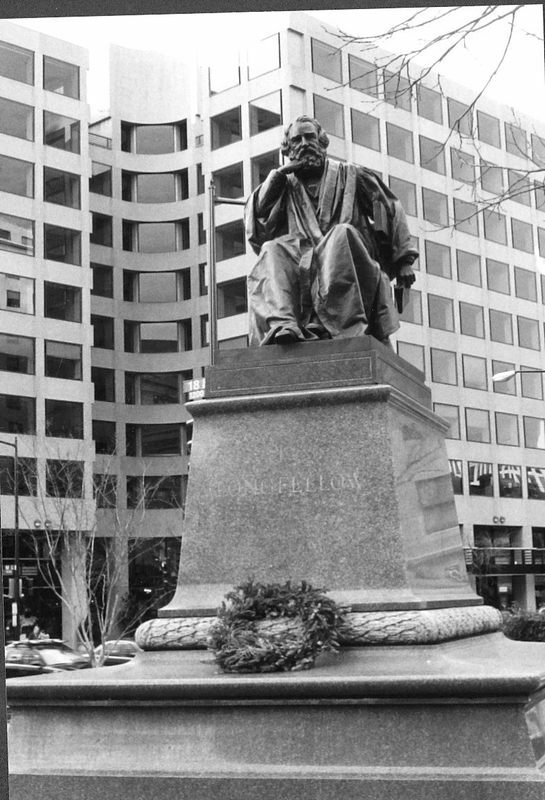 The front of the pedestal features the incised inscription: Longfellow. 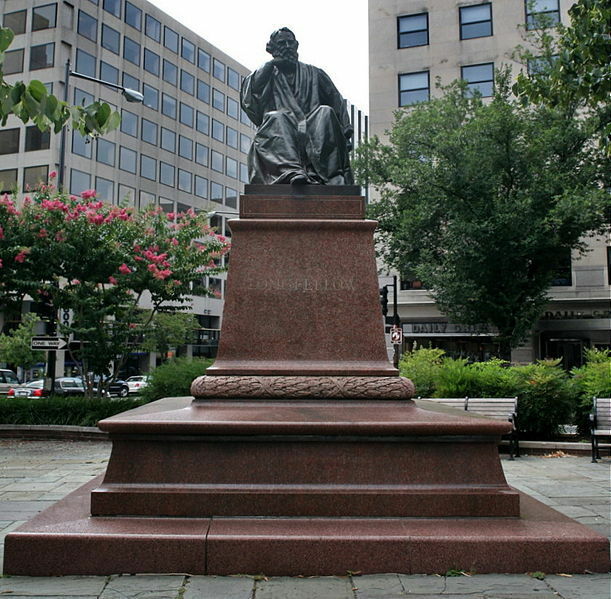 “Henry Wadsworth Longfellow Statue,” DC Historic Sites, accessed April 24, 2019, https://historicsites.dcpreservation.org/items/show/343.